In Municipal Dreams: The Rise and Fall of Council Housing, John Boughton offers a compelling and grounded biography of council housing in England, enlivened by his deep familiarity with the developments he describes. While more convinced by the historical analysis than the more polemical aspects of the author’s arguments, John P. Houghton finds the book a worthy addition to understandings of council housing. Municipal Dreams: The Rise and Fall of Council Housing. John Boughton. Verso. 2018. 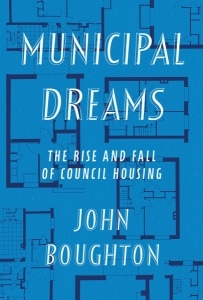 John Boughton’s Municipal Dreams offers a compelling and grounded biography of council housing in England. It also sets out a more polemical argument in favour of ‘the idealism of the state’. Inevitably, there is a tension between a factual history which includes the repeated failures of council housing in planning and execution, and a manifesto which calls for yet greater faith in government as a housebuilder and landlord. The chronology of council housing in England can be split into three periods. The first, formative phase ran from the end of the 1800s to the middle of the 1900s. At the start of this era, philanthropists and a small number of far-sighted ‘corporations’ – the forerunners to modern-day local government councils – attempted to deliver humane habitation in response to the disease and degradation of the Victorian slums. The second period, from 1945 to the late 1970s, is the apotheosis of council housing in England. Squalor was one of the ‘five evils’ identified in the Beveridge report, which provided the framework for the post-war welfare state. And to banish it from England’s green and pleasant land, council housing was one of the ‘five giants’ created by Clement Attlee’s government and sustained by consecutive administrations. During this era, central government subsidised local authorities to build millions of new homes. Millions of people were lifted out of cramped, unhygienic slums and rehoused. As a parallel programme of slum clearance destroyed almost as many dwellings, the parties again competed to build more and more. As a result, quality and space standards were reduced, and developers raced to build what they could, using untested and ultimately unsustainable methods of system-building. The third period, from the late 1970s to the present day, is the story of the fall of council housing. Once a step up the social ladder, by the late 1970s, council housing had become stigmatised and residualised (that is, catering to a small number of people with no other housing options). Under Thatcher, much council housing was sold off, and the stock that wouldn’t shift on the market was transferred to alternative providers. Local government in general was stripped of many powers and prerogatives. Boughton the social historian is a balanced and judicious guide through this rich and nuanced history, and Municipal Dreams takes its place among the works of Patrick Dunleavy, John Burnett and Anne Power. What further enlivens Boughton’s writing is that he is familiar with many of the developments he describes, from years visiting and writing about council estates on his popular and respected blog. As a social historian, Boughton is also critical of the failures of both post-war planning and execution. Revisiting Plymouth, for example, Boughton contrasts the ‘vaunting ambition’ of post-war planners to the ‘bleak and impersonal’ reality of what was built (63). The Aylesbury Estate in South London was declared a ‘concrete jungle’ on its opening (131), and the London Borough of Southwark had to pay three times in remedial works what it had saved through the use of system-built construction methods. Park Hill in Sheffield, which was designed with an unusual level of attention to recreating a sense of community and rehousing neighbours near to each other, had become ‘a very visible symbol of all that had gone wrong with council housing’ (122). This was due to a combination of inadequate maintenance, some design flaws and the deterioration of the local economy which left the population much smaller and poorer. And, of course, there is Ronan Point, the most infamous and deadly high-rise disaster in Britain until the horror of Grenfell. It is, however, in response to these failings that the tension between the historical analysis and the polemical argument becomes most apparent. Boughton makes the case very early on that ‘we need the state’. Not just its ‘regulation and oversight to protect us’ (6), but, going much further, ‘its idealism’ (6). This translates into a general willingness to forgive the failures of government in relation to urban planning, housebuilding and estate maintenance. To return to Plymouth, for example, the author defends the city’s post-war planners on the ground that what they envisaged was ‘designed with real care’ (64). Keeling House in Bethnal Green, East London, decayed into a crumbling mess, but ‘great thought’ has been put into the original plans (24). The problem here is nobody argues that the post-war planners and architects didn’t care enough or act with idealistic intentions. The issue is that they were able to act with impunity, sweeping away lived-in communities and upending people’s lives without giving a say to any of those affected. The author recognises that the ‘the state didn’t, of course, get everything right’ (3), but this is followed immediately by a discussion of the restraints on public spending. In a similar vein, the failure of industrial New Towns like Peterlee is attributed to the ‘gulf […] between aspiration and economic reality’ (79). The answer to the failures of government seems to be more faith in government. Whereas the latter sections of the history point to real and viable alternatives to both more government at one end and a mindless faith in the free market at the other. These were partnerships which brought together the public, private and community sectors, with a focus on both physical redevelopment and investment in social service sand amenities. What’s more, these examples gave tenants and residents more voice, choice and agency – not enough, but certainly more than was permitted in the immediate post-war years. For example, the Hulme Regeneration joint company delivered ‘one of the country’s most radical regeneration transformations’, including a reduction in crime and educational improvements (201). In Castle Vale, Birmingham, residents voted overwhelmingly for a programme of extensive physical redevelopment and measures to tackle social problems (194). The New Deal for Communities programme as a whole delivered meaningful change in most of the areas where investment was made and against most of the indicators used to measure progress (227). These examples had their own flaws, of course. Regeneration has become a toxic word in so many places because of high-profile failures like Housing Market Renewal and the handy use of the term to justify deals that leave existing residents displaced and worse off. Regeneration, for many, is a threat, not a promise. Yet there are also examples out there of neighbourhood renewal that have improved people’s living conditions and the social services available to them, that have created homes for new residents without displacing existing tenants, that have given residents a meaningful voice in change. This tension between historical analysis and polemical argument finds a particular expression in the introduction. This was written in the immediate aftermath of the Grenfell fire. In the second paragraph, Boughton describes the blaze as a symbol of ‘a crisis in social housing’ and, going further, ‘an awful culmination to deeply damaging policies pursued towards council housing, and the public sector more widely, since 1978’ (1). This teleological conclusion fits the polemical strand of the book, from which perspective the fire was the inevitable consequence of decades of under-investment and pernicious policies toward – or more correctly against – council housing. Yet the lesson from the historical analysis is that real life rarely fits simple ideological patterns. For a different perspective on the Grenfell fire, we can turn to Andrew O’Hagan’s extended essay in the London Review of Books. When many other commentators had reached immediate conclusions about what had happened during and immediately after the fire, O’Hagan challenges the general assumptions about the background to the blaze and the role of local agencies. I have written a lot about the relatively short introduction to a much longer book. Yet that is rather the point of my partial dissatisfaction with Municipal Dreams: that the rigour and evidence-driven analysis of much of the book is undermined by the tendency to make generalisations driven more by ideological conviction than the more complicated and contradictory weight of evidence. During an exploration of the Mackworth Estate in Derby, it is casually asserted that ‘we are currently dismantling the Welfare State’ (88). No evidence is proffered in support of such a sweeping statement: instead, it is posited as fact, before we return to the tour of the Mackworth. It is hard to square this tendency with Boughton’s call for ‘a fuller and more nuanced understanding’ of the history of council housing. The historian takes the reader in one direction, while the polemicist pulls in the other. Municipal Dreams is a worthy addition to our understanding of council housing, but it is the historical analysis over the ideological argument that this reviewer found most convincing. John P. Houghton is a freelance consultant and commentator on cities, housing and regeneration. He has worked with local authorities, housing associations and communities across the country on making places better. He is the co-author of Jigsaw Cities with Professor Anne Power and has written extensively on people and place. He has a degree from Oxford University, an MA from the University of London and is a US-UK Fulbright-Humphrey scholar.